The Casa range of four-section profiling beds provides carers with easy patient positioning and treatment, while providing patients with greater comfort and independence. This Handset facilitates the operations of the profiling beds, and is available in three versions, each with different capabilities. Select your desired version using the drop-down menu at the top of the page. Eight-Function Handset: Offers back, knee brake and lower leg elevation. It is supplied as standard with all Casa profiling beds. 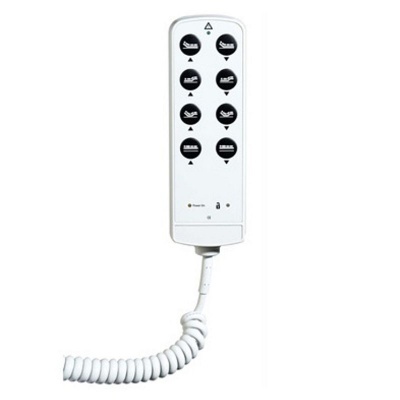 Eight-Function Swipe Handset: Features same functions as the regular eight-function handset with the added benefit of a locking feature with magnetic swipe key activation. Nine-Function Swipe Handset: Offers the same functions as the above handset, with the added inclusion of an anti-Trendelenburg positioning option.